Doubtless the lead pencil qualifies as one of the most used, yet least appreciated, pieces of merchandise in the world. It is the simplest, most convenient and least expensive of all writing instruments. 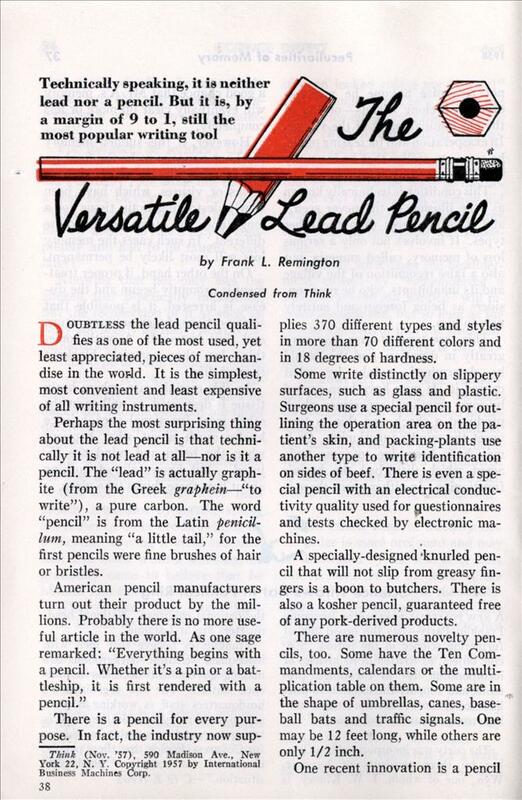 Perhaps the most surprising thing about the lead pencil is that technically it is not lead at all—nor is it a pencil. The “lead” is actually graphite (from the Greek graphein—”to write”), a pure carbon. The word “pencil” is from the Latin penicil-lum, meaning “a little tail,” for the first pencils were fine brushes of hair or bristles. There is a pencil for every purpose. In fact, the industry now sup- plies 370 different types and styles in more than 70 different colors and in 18 degrees of hardness. Some write distinctly on slippery surfaces, such as glass and plastic. Surgeons use a special pencil for outlining the operation area on the patient’s skin, and packing-plants use another type to write identification on sides of beef. There is even a special pencil with an electrical conductivity quality used for questionnaires and tests checked by electronic machines. A specially-designed ‘knurled pencil that will not slip from greasy fingers is a boon to butchers. There is also a kosher pencil, guaranteed free of any pork-derived products. There are numerous novelty pencils, too. Some have the Ten Commandments, calendars or the multiplication table on them. Some are in the shape of umbrellas, canes, baseball bats and traffic signals. One may be 12 feet long, while others are only 1/2 inch. One recent innovation is a pencil with paper in it. A small roll of paper fits in the center of the pencil and is drawn out through a slit in the side. It s just the thing for those who are always looking for a scrap of paper on which to make a note. A popular misconception is that a check, will, or other legal document written in pencil is invalid. This is not true. Any legal document which does not specify otherwise can be legally signed in pencil. In the middle of the last century, many suits were brought in American courts to invalidate wills and contracts written in pencil; in most cases the pencil won. But these court actions brought prejudice against penciled documents that persists to this day. By one means or another, man has been writing for thousands of years. The Greeks and Romans used metallic lead for drawing faint lines. But it was not until around 1400 a.d. that graphite, main ingredient of the modern pencil, first appeared. And for a long time it was used without any covering. About a century and a half later, in 1564, a high wind blew over a heavy oak tree near Cumberland, England. The scarred earth revealed ar slab of black mineral which was actually the dome of a huge deposit of almost pure graphite. Cumberland shepherds used it to brand their sheep. George II maintained a monopoly on the graphite by declaring its exportation a crime. This graphite could be used in its natural state for writing. Recognizing the find as a rich economic prize, merchants cut it into sticks and sold it for writing purposes. 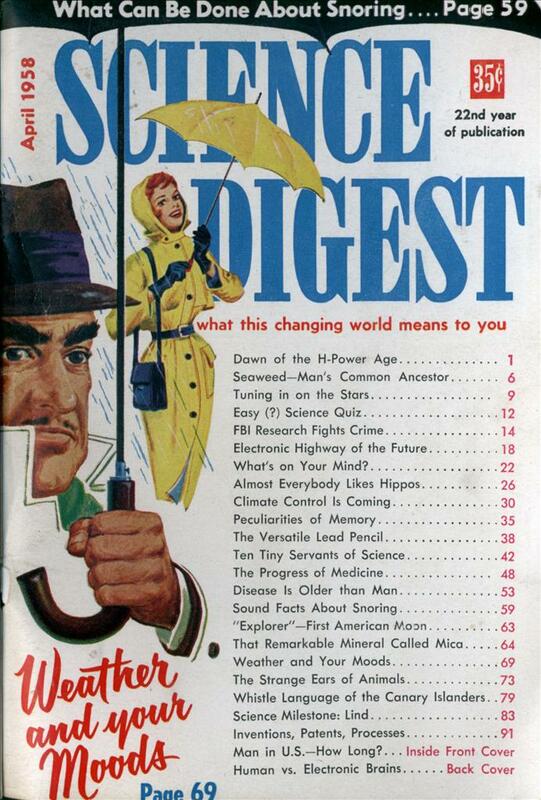 By present-day standards, however, it was far from a satisfactory writing medium. For one thing, the graphite’s degree of hardness could not be varied. Grinding inferior grades of graphite to remove impurities, pencil manufacturers elsewhere encountered almost insurmountable obstacles. Their problem was to bind the black powder together again so it would be hard enough to serve as a writing instrument. In Germany, Kaspar Faber developed a process of binding powdered graphite with sulfur, antimony and resins. Although unsatisfactory, the pencils made in this manner had to serve for lack of better ones. Napoleon Bonaparte had a finger in the development of the modern pencil industry. Cut off by embargoes from importing English pencils, he was stuck with his own impure French graphite. Never one to accept second best, Napoleon commissioned Nicholas Conte, a mechanical genius and scientist, to solve the problem. Conte found the answer in 1795. By mixing refined graphite powder with clay, then firing it like a piece of pottery in a kiln, he produced a firm hard lead. German researchers subsequently perfected the method and the lead pencil was launched on its way to general use. William Monroe, the Concord, Mass., cabinetmaker, made the first pencils in the United States. When the War of 1812 halted imports of pencils from abroad, Monroe developed machinery to make wooden slats, each one grooved to half the thickness of a pencil lead. Two slats were glued together with the lead between — the method still being used today. Monroe’s first American-made lead pencils — about 30 of them — were sold to a Boston hardware dealer in July 1812. But it was not until many years later that domestically-pro-duced pencils began to hold their own in preference to European brands. It is said that Abraham Lincoln wrote drafts of his Gettysburg Address with a German-produced pencil. During Lincoln’s administration a protective tariff was raised against imported pencils. This was really the beginning of the lead pencil industry in the U. S. Several domestic pencil factories were established between the end of the Civil War and 1870. Today the nation’s 15-odd pencil manufacturers produce about a billion-and-a-half wooden pencils a year for domestic consumption. This amounts to about nine apiece for each man, woman, and child in the country. At manufacturer’s wholesale prices this business amounted to $35 million in 1957—not including mechanical pencils. About nine wooden lead pencils are sold here for every one of all the other varieties of writing tools. The modern 7-inch-long pencil can draw a line 35 miles in length; it can write an average of 45,000 words, and it can take an average of 17 sharpenings. For some obscure reason, about 75 percent of all pencils sold for general use are finished in yellow. A carpenter’s pencil, incidentally, is usually finished in bright red to be easily distinguishable among wood shavings. Pencil users display a surprising array of idiosyncracies. In some offices, for instance, bosses prefer that each department be equipped with pencils having a separate and distinct color. At least one executive is known to order a dozen new and freshly-sharpened pencils placed on his desk each morning. He never uses one that has been resharpened. Thomas Edison, on the other hand, demanded his pencils custom-tailored to his own specifications. They were but 3 inches long, with a very soft black lead and oversize wood. Theodore Dreiser wrote drafts of his novels with a lead so soft that it smudged the paper almost to illegibility. Ernest Hemingway, Eugene O’Neill, Thomas Wolfe and numerous other writers usually wrote their manuscripts in pencil. U. S. pencil-makers comb the world for materials for their product. Ceylon and Mexico supply graphite. Clay comes from Bavaria and wax from Brazil. All told, each pencil requires some 40 different materials and goes though about 125 different production steps. It would cost a do-it-yourself addict about $50 to make one. To manufacture lead for modern pencils, clay and graphite are ground together and mixed with water. The amount of clay determines the hardness of the lead—the more clay, the harder the lead. The resultant dough is packed into the cylinder of an extrusion press and squirted out by pressure through a small hole. This wet dough string is cut to pencil length, then dried and kiln-fired. Finally, the 7-inch-longr brittle, porous graphite rods are impregnated with a smooth waxy mixture. The leads are placed in grooved wooden slats of pencil length, from four to seven pencils in width, and half a pencil thick. Another grooved slat covered with glue goes over the one containing the lead. The two are then pressed together under hydraulic pressure into a so-called pencil block. The grooves of the two slats fit perfectly around the individual leads, thereby giving the impression to the uninitiated that a pencil is made by drilling a hole in the wood and then inserting the lead. After drying, the block passes through a machine which cuts and shapes the block into rough individual pencils. Sandpapering gives a smooth finish, after which the pencils are lacquered, polished and stamped. If the pencil is to have an eraser, it is put on by an automatic machine that shaves the end of the pencil, pinches on the brass tip, and inserts the rubber all in one operation. Judging by the ever-increasing demand for them, it appears that the versatile lead pencil is here to stay. At least as long as business and industry, educational institutions and the U. S. Government continue on the scene, for they are its three largest consumers. “There is also a kosher pencil”!? Really, why not just stop chewing on it! Henry Petroski published an excellent book on the pencil back in 1992. Seeing that article, and the banner ad for the AG7 “moon pen” reminds me of this apocryphal tale of the Americans spending millions on R&D for a pen that would work in outer space, while the Russians just used a pencil.